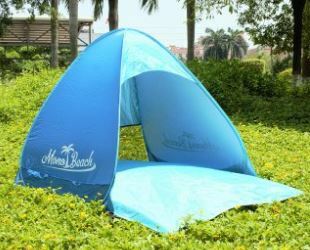 Check out this Monobeach TM Portable Outdoors Quick Cabana Beach Tent Automatic Pop Up Sun Shelter on sale for $38.99 (Retail $70)! Recommended for 2-3 PERSON; 2 ADULTS OR 1 ADULT, 2 CHILDREN. People often used in beach sun shelter tent for babies. Special silver coated fabric around the full coverage to ensure that the coverage area of Anti-UV effects. Sun protection for all-day shade at the park, beach, sporting event or just relaxing in the backyard, comes with its own carry case. Double type B dense interwoven mesh, enhance ventilation, more upscale appearance. Wind comprehensive design for fixed. I’m grabbing this for my daughter and her friends to play in during baseball and soccer games!